Raise your glass to the Keweenaw Peninsula’s splendor and the history of Michigan’s Copper Country! WE’ve partnered with the historic Calumet Theatre to resurrect Copper Queen Whiskey, first served in Red Jacket saloons and likely sourced and relabeled by Narciso R. Bianchi in 1914. Red Jacket became Calumet, where the whiskey of those times nearly faded away if not for an original bottle discovered by residents, Jerry and Sandy Mitchell. Take a sip of history, your Copper Queen™ beckons. Carefully sourced and relabeled by Iron Fish Distillery with proceeds supporting the Calumet Theatre. Red Jacket became Calumet, where the whiskey of those times nearly faded away if not for an original bottle discovered by residents, Jerry and Sandy Michell. Take a sip of history, your Copper Queen™ beckons. Narciso R. Bianchi was born around 1880 in Italy and immigrated to the United States in 1897. Around 1904, Bianchi opened a saloon and wholesale liquor business with Pietro Pera in the east storefront of the Stephen Jerman building at 612 Oak Street on the southeast corner of Oak and 7th Streets in Red Jacket, under the name of Pera & Bianchi. Pera lived upstairs, and Bianchi lived at 411 7th Street. In 1905, Bianchi’s brother John immigrated to the United States. John Bianchi worked as a teamster for the Calumet Brewing Company. Sometime around 1909 Pera left the partnership with Narciso Bianchi. Bianchi operated the saloon and the wholesale business alone for a short time. By 1912, he had entered a business partnership with John B. Perenchio, under the name of Bianchi and Perenchio. By 1916, Bianchi was again independent. 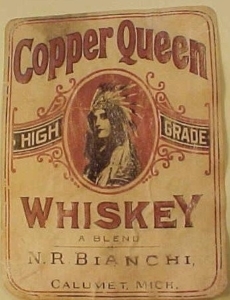 By 1914, he advertised Copper Queen Whiskey as a specialty. Nothing indicates that Bianchi distilled the whiskey himself; it’s likely that he just sold it under his own label. Bianchi was a member of the Red Jacket fire department. Bianchi seems to have closed the saloon and wholesale business by 1926. Bianchi’s son Ronald, who was born around 1912, later owned the Oak Room and Town Pump on 6th Street. Available in Michigan through Imperial Beverage.